As the regulatory requirement, in Britain and elsewhere, to assess reservoirs and lakes expands to include smaller bodies of water, HR Wallingford has developed a remote control boat which is able to collect hydrometric data quickly, simply, safely and accurately. The ARC-Boat employs a sophisticated SonTek M9 Acoustic Doppler Profiler (ADP®) which is a 5-beam depth sounding device that scans the reservoir bed as the boat is guided across the water’s surface. Recorded data are analysed by SonTek Hydrosurveyor software to produce accurate depth measurement in addition to 3-D maps of the entire water body. With a small amount of post-processing in GIS or 3D CAD, an accurate water volume can be determined. The reservoir sections of the 2010 Act are dependent upon on the development of secondary legislation which is likely to specify the reservoir capacity above which water bodies will be regulated. However, irrespective of the content of this secondary legislation, the Flood and Water Management Act 2010 has clearly generated an urgent need for reservoir assessment and the application of the ARC-Boat for reservoir bathymetry is therefore propitious. The ARC-Boat has been designed with a V-shaped hull to give optimal manoeuvrability and minimal air entrainment beneath the ADP, ensuring high quality data collection. The robust and reliable design, including grab handles fitted to the upper deck, mean that the boat can be launched from the most difficult locations and a unique detachable bow means that the ARC-Boat can easily be transported in an average sized car. The SonTek M9 is a 9 beam acoustic Doppler profiler, using 5 beams at any one moment for depth measurements from a wide footprint on the water bed. This means that the time spent ‘driving’ the boat is minimised in comparison with single beam instruments. Importantly, the M9 is able to operate in depths ranging from 15cm to over 40m. The boat employs industry standard remote control with a minimum range in excess of 200m and Bluetooth communications provide data transmission to an onshore laptop. HydroSurveyor™ is a system designed to collect bathymetric, water column velocity profile, and acoustic bottom tracking data as part of a hydrographic survey. The two key components of the system are the HydroSurveyor™ Acoustic Doppler Profiler (ADP®) platform, and the powerful, yet user-friendly, data collection software. With the HydroSurveyor™ platform, SonTek is able to offer an exclusive 5-beam depth sounding device, with built-in navigation, full water column velocity (currents) profiling, full compensation for speed of sound (with the CastAway-CTD), and integrated positioning solution. In addition to the smaller reservoirs that will have to be surveyed, larger reservoirs will be able to take advantage of the new technology to assist in operations such as the creation of sedimentation models. These models inform strategies to prevent capacity depletion and to extend the lives of reservoirs through flushing, excavation, dredging etc. Similarly, ARC-Boat surveys can be employed around submerged hydropower or draw off pipe intakes to assess sedimentation levels – a vitally important role because sediment can seriously damage turbines, or influence operation of scour pipes or water supply draw off pipes from reservoirs. As a result of the Flood and Water Management Act 2010, the owners of small reservoirs will need to prove whether their water bodies are affected by the amended Reservoirs Act 1975, by determining an accurate volume figure for their reservoirs. Typically, this will include landowners, farmers and organisations such as the National Trust. However, the development of the ARC-Boat with the M9 and the latest HydroSuveyor™ software mean that such work is now faster, safer and significantly lower cost. This is good news for the owners of smaller reservoirs for whom any survey cost is a new cost. Andrew Donnelly, Senior Network Manager at Lisbon-based EPAL, which supplies water to more than 3 million people, reports on the success of a year-long collaborative study with Intellitect Water to monitor water quality in the city’s extensive distribution network. 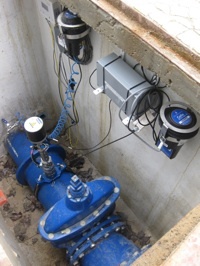 In January 2010, EPAL commenced a pilot project to monitor water quality in Lisbon’s distribution network using Intellitect Water’s innovative Intellisonde™ in-pipe water quality monitors. The trial sought to assess both the technology and the benefits to be gained from continuous access to water quality data between the treatment plant and the consumer. Developed to continuously monitor up to 12 parameters within drinking water distribution networks, the Intellisonde™ is a small water quality monitor that can be inserted into pressurised pipes. Intellisondes™ can be supplied with their own GPRS telemetry capability, but in this trial the instruments’ analogue output capability was utilised to interface with an existing telemetry network. 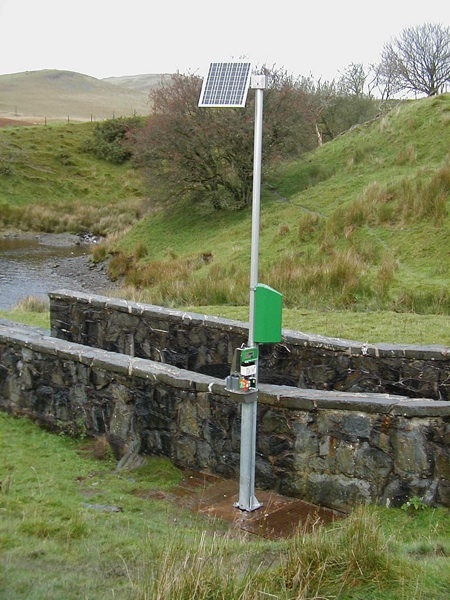 The project enabled an evaluation of logged water quality data and tested the ability of the remote monitoring network to integrate the data into EPAL’s existing network management system. This data was used by EPAL to perform diagnostics and to enable process improvements as part of a proactive approach to network management. EPAL had previously installed and operated a network of nearly 300 Cellos (wireless dataloggers) and associated software for monitoring flow and pressure values, so it was advantageous to integrate Intellisondes™ into this network monitoring system. Four Intellisondes™ were deployed strategically in a sub-zone and connected to Cellos. The Cellos have eight channels and the Intellisondes™ were configured to measure seven water quality parameters, with the eighth channel configured to monitor battery life. The water quality parameters measured were Temperature, pH, Turbidity, Conductivity, Free Chlorine Residual, Free Chlorine + Mono-Chloramines, and ORP (REDOX). The Intellisondes™ logged at 15 minute intervals with the data sent remotely via the Cellos every 24 hours, because this is the same transmission frequency operated by EPAL’s flow and pressure loggers. The data collection software was programmed to alarm any water quality events outside defined limits for Free Chlorine and Turbidity and the battery voltage programmed to monitor the battery power decay. Initial installation of the equipment and calibration were carried out with the support of Intellitect Water. Monthly checks were carried out by the EPAL Team using portable calibration equipment to verify the accuracy of the measurements. Planned maintenance routines were undertaken after six months to replace the Chlorine Sensors and Reference Electrodes, which had reached the end of their useful life. Initially, Intellisonde™ battery life was less than expected but this was significantly improved by Intellitect Water during the pilot project by increasing the battery capacity and this is now a standard feature for all new installations. 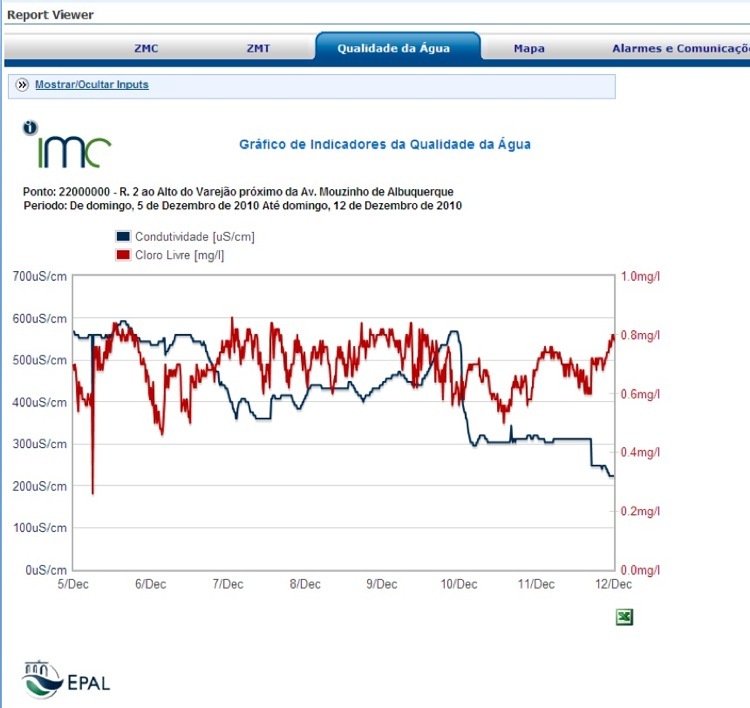 The water quality data was successfully integrated into EPAL’s network monitoring software (IMC). The software was capable of downloading data from all sites, initially combining any two water quality parameters with the data from the district monitoring area flow meters, which were being logged separately. Later, the trial was further enhanced so that data could be combined for each Intellisonde™, which provided information to track water residence time within the distribution network through the use of EPANET hydraulic modelling software. The data showed that changes in Free Chlorine Residual were caused by the operation of the sub zone and provided a real benefit in understanding flows and water quality in different network operating systems. The data also showed that the sensors were very reliable, and the calibration of these measurands was simple and easy to implement. Following extensive evaluation of multiple Intellisondes™, EPAL has formally approved the Intellisonde™ for use and their management team has recommended wide deployment in order to exploit the benefits of continuous monitoring. Engineers at Intellitect Water have developed a version of the company’s innovative multiparameter water quality monitoring sonde, the ‘Intellisonde FE™’ that can continuously monitor final effluent without the need for chemicals or frequent maintenance and calibration. 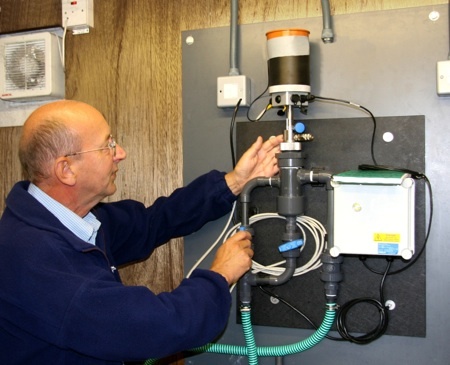 A unit has been installed on the final effluent of Wessex Water’s Holdenhurst wastewater treatment plant in Bournemouth (GB) since January 2010 and initial results indicate that this new technology could bring the advantages of online monitoring to a much larger proportion of wastewater treatment plants. The Intellisonde FE™ is a very small multiparameter monitor that is able to run unattended for weeks. Low capital and operational costs will mean that it will become possible to install continuous monitors at plants for which the costs were previously considered prohibitive. The Intellisonde FE™ is located in a flow-through chamber which is fed by a submerged sampling pump located in a sump. A level gauge ensures that the sump does not pump dry. The trial unit has been fitted with a small strainer to prevent any possible accumulation of dirt in the measurement chamber. However, it has only been necessary to occasionally remove small stones and snails, although these did not have any effect on the measurements. Inside the sonde head, tiny solid-state sensors continuously monitor conductivity, pH, temperature, turbidity and ammonium. The unit can log at intervals between one minute and one hour on all parameters simultaneously. Measurements are retained on an internal datalogger, however data is transmitted via GPRS to a dedicated server which feeds a web site to enable 24/7 access to (almost) live water quality information. The units are also able to provide an analogue output that could interface with a water company’s regional telemetry system, providing a closed-loop system for data protection. The graph shows recorded data during February and March 2010, and Mike reports that no calibration or maintenance was necessary during this period. 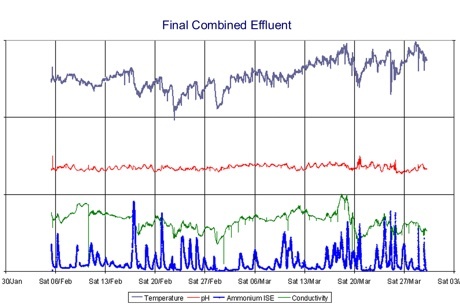 The data shows several weeks of unattended use, with reported ammonia levels agreeing well with a second instrument installed at the same point. Simultaneous monitoring of other parameters can indicate possible causes of variations in effluent quality, which may in turn lead to more efficient treatment management. For example, reduced conductivity may indicate a correlation between rainfall and ammonia. Without this data, it would be significantly more difficult to diagnose causes of variations in effluent quality, particularly at unmanned treatment works where data is restricted to discrete samples during the day. It should be noted that the ammonium peaks in this data are recorded during the night. The Intellisonde FE™ will also provide major financial advantages. It is priced for volume deployment, significantly below traditional effluent monitoring systems, which means that it will become cost-effective for a much larger proportion of works and will save the cost of sampler visits and analysis. The European Water Framework Directive and recent technological developments are radically changing the ways in which water resources are monitored. Robin Guy, OTT Hydrometry’s Senior Technical Engineer explains. The European Water Framework Directive (WFD) aims to promote sustainable water use and to protect water resources. This relates to surface and ground water quantity, quality and ecological status and takes into consideration the likely impacts of climate change. As a result, a holistic approach to the protection of water resources has developed – Integrated Catchment Management (ICM). This aims to protect water resources at source by avoiding diffuse and point source pollution, by minimising incidents of unconstrained flooding and drought, and by enhancing biodiversity. A catchment is defined as the land area from which all water drains to a single watercourse. Consequently, the management of catchments necessitates a clear understanding of the complex relationships between land, air and water. In order to be able to meet the objectives of the WFD it has become necessary to adopt a different approach. The complete hydrological cycle for a catchment must be monitored, which means that it is now necessary to monitor precipitation, surface water, groundwater, soil moisture, vegetation levels and other factors such as land use. A need has also arisen to move away from spot measurements to continuous or semi-continuous monitoring. In the past, remote locations have been problematic because of a lack of power and the time and cost associated with site visits. However, technological advances in recent years have resulted in a far greater proportion of monitoring data being collected automatically in the field and transferred remotely; this has coincided with a greater requirement for field data as a result of the WFD. Low power stand alone dataloggers are able to store many thousands of records without the need for mains power – and where a continuous power supply is required this can often be provided by a solar or wind powered charger. Communication technology has advanced beyond all recognition in recent years. As a result, a choice of highly effective and reliable wireless communications options exist, most of which are relatively low in cost and power requirement. These include GPRS, SMS, radio and satellite. Sensor technology has also advanced to support the move to remote monitoring. Sensors are now more accurate, more reliable, less prone to drift and consequently require less frequent service and/or calibration. For example, in 1662 Sir Christopher Wren invented the first tipping bucket raingauge and this technology became the standard methodology throughout the 18th, 19th, and 20th centuries – an astonishing achievement! However, in the early part of the 21st century a new technology emerged to replace Sir Christopher’s which was able to remain accurate during intense rainfall, to require less maintenance and to provide precise data on rainfall intensity. The new device, known as ‘OTT Pluvio’ employs a weighing measuring principle and is able to operate unattended in remote locations for long periods of time. Many national rainfall monitoring authorities around the world are moving over to the newer technology. However, it is interesting to note that tipping bucket raingauges remain popular in many countries because of a requirement for direct comparability with historical data. Inevitably, under-reading of rainfall during high intensity precipitation will continue where this is the case. Historically water quality measurements in remote locations have been undertaken with spot measurements using portable instruments and kits or by taking samples to a laboratory for in-depth analysis. However, here too, sensor technology has advanced considerably and it is now possible for multiparameter water quality monitors to log an array of water quality parameters almost continuously for several weeks without any requirement for maintenance or recalibration. Automatic water samplers have also enhanced monitoring capability, by taking water samples at pre-set intervals and storing them for subsequent analysis. The latest samplers can be activated by changes in local preset parameters, for example breeches of flow or level thresholds signifying a major event, thereby enhancing our understanding of water quality changes with variable flow regimes. The ability to monitor a catchment continuously means that the pollution prevention and hydrological objectives of the WFD are more easily met. Continuous monitoring enables the rapid detection of point source pollution and provides an opportunity to take remedial action before serious damage occurs. Similarly, if water level or flow data reaches pre-set low or high alarms, it becomes possible to minimise the effects of flooding and drought. The provision of real time data also assists resource management ensuring that underperforming or faulty sites can be targeted and rectified immediately, not only improving data quality but also helping in the continuous drive for efficiencies. One of the key advantages of continuous monitoring over spot data, is that it records peaks and troughs, providing much greater insight into the cause and effects of changes in a catchment. Continuous long-term data also enables more accurate identification of diffuse pollution. New communications technologies combined with continuous monitoring also offer important advantages for stakeholders because it is now possible to display ‘live’ data on a website for the benefit of land owners, regulators, planners, developers, local residents etc. This approach was recently adopted at a major housing development in Waterlooville, Hampshire (GB). The proposed housing scheme included the building of 2550 homes, which would have a large potential effect on local drainage and flooding. However, Sustainable Urban Drainage Systems (SUDS) have been established to try and mitigate against any potential for flooding by creating a network of ponds and swales. OTT Hydrometry has installed a number of water level, flow and rainfall monitors at the site to provide continuous performance data for all stakeholders. The main objective is to ensure that the development at Waterlooville will not increase the risk of flooding, affect the water quality or harm the ecology of the receiving watercourses. The data is then posted to a live website to achieve community engagement through transparent and open data collection. The developers are endeavouring to show that through the measures they have put in place localised flooding will not only be mitigated but also reduced, where possible. The new holistic approach to monitoring has been adopted within a British Dept of Environment, Food & Rural Affairs (DEFRA) funded project on the outskirts of Exmoor National Park, near Bristol, in South West England. The project has been designed to study the effects of different land management practices particularly with respect to flooding and water quality. It is anticipated that the results of this trial will inform future land management and help to develop flood risk models for the area. In addition, the monitoring regime will demonstrate best practice for compliance with the requirements of the WFD. Penny Anderson Associates (PAA) are managing the project which has established a catchment-wide monitoring network consisting of the latest OTT instruments such as water level monitors, doppler water velocity meters and automatic raingauges. PAA are conducting flow gaugings at selected locations in order to develop site specific ratings, thereby allowing the generation of continuous flow data through the conversion of measured level data. In addition, Exeter University (GB) has installed water samplers that are activated by level sensors and will operate automatically at pre-defined river levels. The project will showcase different communication methods including GSM and radio. However, satellite communication may be installed at one site for which radio and GSM are not applicable. The Waterlooville and Exmoor projects are good examples of the new WFD prompted approach to monitoring. However, the new catchment monitoring requirements, coupled with recent technological advances, will result in the generation of much greater volumes of data. It is important to note, therefore, that data will only contribute to the catchment management plan if it is representative and interpreted correctly, so a level of expertise is often necessary when establishing and managing a monitoring network. Five buoy-mounted automatic water quality monitors (AWQMs) have been installed by YSI Hydrodata engineers at the new Tyne Tunnel project (GB) to ensure that construction operations do not significantly affect river water quality. Unusually, the contractors have not taken ownership of the instrumentation, preferring instead to simply purchase the data and alarms. In 1967 a two-lane toll vehicular tunnel was built under the River Tyne in the North East of England, a few miles east of Newcastle upon Tyne. Originally designed for a daily traffic throughput of 24,000 vehicles, it now carries 38,000 customers per day. In July 2005, approval was given to the Tyne & Wear Passenger Transport Authority (now the Tyne and Wear Integrated Transport Authority – TWITA) for a new tunnel and construction began in Spring 2008. The tunnel has been constructed utilising a hybrid method – immersed tubes form the river section and a cut-and-cover method has been deployed on the landside. The river section involved the construction of four, 90m long, 15m wide and 8.5m high concrete units in the nearby Walker dry dock that were subsequently floated down river and dropped into position. The riverbed location for the concrete cylinders that would form the tunnel was formed by a ‘cutter suction dredger’ capable of pumping up to 7000m3 of sediment/water slurry per hour. In total, the dredger removed 400,000m3 of sediment over a 5 week period during December 2009. YSI Hydrodata was contracted to provide continuous monitoring data from five locations in the river. They did this by setting up a website accessible to the key stakeholders – Newcastle University, Newcastle City Council, the contractor Bouygues Travaux Publics, the dredging company Jan De Nul, Port of Tyne and the Environment Agency (EA) – to which the data were transmitted in real time. Originally, the plan was to employ a grab dredger to create the trench, with sediment removal by barge and disposal by landfill. However, the possibility arose of using the dredged material to infill Port of Tyne’s redundant Tyne Dock, thereby reclaiming 13 acres of land for use by Port of Tyne. The cutter suction dredger removed material with a solids content of approximately 20% so a sheet pile wall was erected in the dock to optimise settlement of the solids. Furthermore, silt curtains were employed to limit the level of solids in the overflow to the river. One of the AWQMs was sited close to the overflow point to ensure that this did not adversely affect water quality. The EA reached a legal agreement with TWITA that included water quality standards to ensure the protection of the environment and particularly migrating salmon on their way to breed in the upper Tyne catchment. The agreement also required AWQMs to demonstrate that these standards were met and to trigger corrective action if they were breached. As recently as 1959, no salmon were caught in the Tyne but they have returned as water quality recovered from domestic and industrial pollution. For the last ten years the River Tyne has arguably been the finest salmon river in England and Wales, with over 3000 salmon caught each year. The AWQMs were installed around 12 months prior to the commencement of dredging operations so that ‘normal’ water quality conditions could be established. The standards were based on differences between measurements of water quality upstream and downstream (depending on the tide) of the dredging operations. This allowed the impact of the dredging operation to be distinguished from background variations. Each of the YSI AWQMs is fitted with highly accurate sensors that are designed to operate in challenging environments. These continuously measure dissolved oxygen, turbidity and temperature in addition to velocity. The turbidity measurement is particularly important in this case because it is a surrogate for both suspended sediments and any contaminants that are associated with them. The AWQMS raised alarms on a small number of occasions, largely as a result of high turbidity in the overflow from the dock. When alarm conditions arose, an email was automatically generated with a copy going to a mobile phone on the dredger, whereupon dredging ceased until water quality had returned to acceptable levels. This project was unusual in a number of respects. Firstly, the environmental monitoring took place for a considerable length of time – both during the project and for 12 months beforehand. Secondly, the environmental conditions were occasionally severe and thirdly, the contractor decided that data would be purchased instead of instruments. This placed the responsibility for installation, ongoing calibration and maintenance with YSI Hydrodata. The European water and wastewater (W&WW) sector has been offering sustainable opportunities for the automation and control solutions (ACS) market mainly due to supportive legislation. Stringent regulations and intervention from private participants have paved the way for prospective growth opportunities for ACS in the European W&WW sector. Additionally, investments from the developing economies of the Central and Eastern European (CEE) regions contribute to building more automated plants in Europe. New analysis from Frost & Sullivan, Strategic Analysis of Automation and Control Solutions in European Water and Wastewater Sector, finds that the market earned revenues of $623.3 (€500+) million in 2009, and estimates this to reach $825.5 (€670+) million in 2016. The markets covered in this research service by product type are programmable logic controller (PLC), supervisory control and data acquisition (SCADA), disturbed control system (DCS), human machine interface (HMI), manufacturing execution systems (MES) and industrial asset management (IAM). The majority of Europe has poor networking with regard to water distribution and wastewater treatment. EU directives such as the Water Frame Work Directive, Drinking Water Directive and Urban Wastewater Treatment Directive are the main political drivers that have catalysed strong opportunities for treatment techniques such as membrane bio-reactor (MBR), ozone and ultraviolet (UV). The accession countries face the impact of EU regulations the most due to the timeframe within which they have to transpose the directives into actions. Regions such as Eastern Europe, but also others like Iberia, parts of Italy, and Benelux are undertaking large-scale implementation of water treatment plants. Significantly, European Union is funding the new member states from the CEE region to improve their W&WW infrastructure through the cohesion fund mechanism, leading to a plethora of design, build and operate (DBO) opportunities. All these initiatives are likely to spur growth of the European ACS market for the W&WW industry. However, a key challenge faced by ACS manufacturers is the need to provide systems that seamlessly integrate with the existing plant infrastructure.